I would recommend this cookbook to those with some experience – this is not a recipe guide, but rather an inspiration source from a chef with well-grounded tastes. The recipes are easy to follow, are not difficult or overly time consuming in preparation, and show culinary flair and wisdom without being trendy for trend’s sake. I would describe the dishes as simple food for gourmets. The book’s design and photographs are tasteful. With this praise in mind, I am disappointed in the book’s production – unforgivable oversights such as: three prominent photographs throughout the book of what appears to be plates of crispy fried onion rings… but no mention or recipe. Or the recipe for a Salmon Roulade accompanied by eight very clear how-to photos – the photos show skinless salmon, butterflied and pounded, but the recipe calls for fillets with skin on, and no mention of pounding. An edit for future releases would be welcome. My opinion is this would be a logical cookbook for those who appreciate Jaques Pépin’s series of books aimed at the aspiring novice, as well as for more experienced cooks who would like some inspiration for higher-end simple food. This book is the example of what a cookbook should be. Beautifully written and photographed it deserves to be on display in your home. And if that is not enough the recipies will knock your socks off. This is why Cindy Pawlcyn is one of this countrys greatest chefs. Mustards grill is the bringing together of seasonality, diversity and the best of what California has to offer. I spent some time at Mustards eating and I can tell you this book stays true to the restaurant. Congratulations Chef on a great writing effort. I was given this cookbook for Christmas and was a little intimidated by it. It looks more like a coffee table cookbook at first glance — something fun to look at and read but too challenging to actually use. However, I have fallen in love with this cookbook!! The Jack Daniel’s Pecan Chocolate Cake with chocolate sauce is divine AND easy (and for those who don’t eat wheat or gluten, totally flourless). The House-Made Ketchup is extremely good and makes a great bbq sauce (recipe also included). Even though the recipes are not hard, this is no canned-mushroom-soup cookbook. If you’re the king (or queen) of fresh and don’t mind spending a little time in the kitchen now and then, you might just love it. Kudos to Mustard’s for sharing their best. I received this on Christmas Eve, spent all day 25th on the sofa w/ it, cooked the pork chop last night, and purchased two today!! One for my sister-in-law, one for our! chef!! 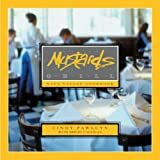 We love the restaurant, & the book is true to the Mustard’s experience! !